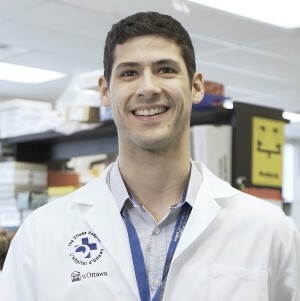 Marc-Olivier Deguise, a MD/PhD student in Dr. Rashmi Kothary’s lab, will receive the 2018 Jim Glionna Canadian Medical Hall of Fame Award for medical students in a ceremony in Montreal on May 2, 2019. This award recognizes medical students with a track record of community leadership, superior communication skills and demonstrated interest in advancing knowledge. Deguise’s research focuses on the fatal neurological disorder called spinal muscular atrophy (SMA). It was thought that SMA affected only the nerves controlling the muscles, but his discovery suggests that it also impacts many other organs, including the skeletal muscles, the immune system and the liver. He was previously awarded The Ottawa Hospital’s 2017 Worton Researcher in Training Award for this work. To help bridge the gap between clinical and research training in medical school, Deguise also established an annual event in collaboration with CHEO to introduce medical students to prospective research supervisors in a speed-networking model. See story by uOttawa for details.